An easy way to find out how much free space you have left on your hard drive is by double-clicking on its icon on the desktop to open a Finder window. Once the Finder window opens, take a look at the status bar. 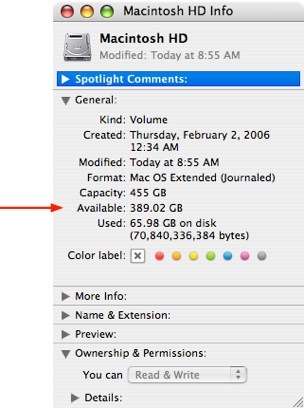 It will tell you how much free space you have left on your hard drive. You can also obtain this information by control-clicking (or right-clicking if you have a two-button mouse) on any drive and selecting Get Info. In the General section, look for the Available field. The number after it will tell you how much free space you have left on the drive.